There was no azure sky to welcome the Miami Open at its new venue as a constant drizzle washed out the first round of play. Nevertheless, two weeks of exhilarating tennis prepare to unfold as many familiar faces will parade through with the goal of capturing the title. On the gentlemen’s side, three time champion Roger Federer is on a collision course in the quarterfinals with 2018 Wimbledon Finalist Kevin Anderson. The South African surprised the former world number one in the Wimbledon quarterfinals last year after Federer was up two sets to none. Stefanos Tsitsipas, the 20 year Greek, who upended Federer a few months ago at the Australian Open could be Federer’s opponent in the semifinals. Fresh off his biggest title at Indian Wells, Dominic Thiem will attempt to garner the rare sunshine double. However, he will likely need to go through reigning world number one Novak Djokovic, a six time titlist in Miami. Moreover, John Isner, the defending champion will have plenty to say. He is slated to clash with Djokovic in the quarterfinals. Naomi Osaka will have to show the form that led her to capture the last two majors if she plans to walk away with her first trophy in Miami. The world number one could potentially meet Garbine Muguruza, the 2016 French Open and 2017 Wimbledon champion, in the fourth round or 2018 Australian Open winner, Caroline Wozniacki. In the quarterfinals, 2 time major holder, Angelique Kerber possibly awaits Osaka. To add to the degree of difficulty, the semifinals could be a rematch of this year’s Australian Open final with Petra Kvitová. Still searching for her maiden trophy since the birth of her baby, Serena Williams is back at one of her favorite events. The eight time titlist will likely find world number two Simona Halep in the quarterfinals in her way. In the semifinals, defending champion Sloane Stephens or Karolina Pliskova could be Serena’s obstacle. Pliskova shocked the 23 time major holder this year in Australia down 1-5 in the third set in the quarterfinals. As a 3 time victor in Miami, unseeded big sister Venus is also a dangerous floater on Serena’s side of the draw as well. As the storms clear, who will ultimately shine in the South Florida sun on championship day? Stay tuned. The 2019 Miami Open will break ground at its new location at the Hard Rock Stadium next month. Today, the tournament announced the players field that will be taking to courts at the state of the art facilities in Miami Gardens. The ATP and WTA field includes a total of 19 Major singles champions. The men’s side will be highlighted by the 2019 Australian Open champion Novak Djokovic. Joining Djokovic in Miami are the likes of Rafael Nadal, Roger Federer, Juan Martin del Potro and 2018 Miami Open champion John Isner. The women’s side will be highlighted by the 2019 Australian Open champion Naomi Osaka. Osaka will be joined by defending Miami Open champion Sloane Stephens, Serena Williams, Simona Halep, Petra Kvitova and Caroline Wozniacki. 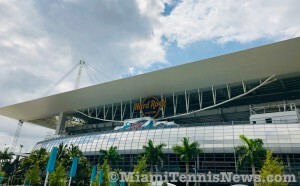 Miami Gardens, FL (February 6, 2019) – The 2019 Miami Open presented by Itaú will make its debut at Hard Rock Stadium March 18-31, and fans will have the opportunity to see one of the best player fields in tennis at its new lifestyle and entertainment venue. This year’s extraordinary lineup features 19 players who have combined to win 108 career Grand Slam singles titles including all-time record holders Roger Federer and Serena Williams. Reigning Australian Open champions, and the world’s No. 1 ranked players, Novak Djokovic and Naomi Osaka top one of the strongest ATP and WTA tournament draws of 2019. Overall, each of the top 79 ranked men and 76 ranked women have entered to compete in Miami. Federer and Djokovic lead a men’s field that includes 17-time Grand Slam champion Rafael Nadal, three-time Grand Slam champion Stan Wawrinka, and former US Open champions Juan Martin del Potro and Marin Cilic, along with defending Miami Open champion John Isner. The player field also boasts the next generation of ATP stars including World No. 3 Alexander Zverev, Australian Open semifinalist Stefanos Tsitsipas, American Frances Tiafoe and Australian Nick Kyrgios. The women’s field is even more impressive. Osaka, winner of the last two Grand Slam singles titles, leads a field that includes 23-time Grand Slam champion Serena Williams and defending Miami Open champion Sloane Stephens. Fans also will have the opportunity to see seven-time Grand Slam Champion Venus Williams, five-time Grand Slam champion Maria Sharapova, two-time Grand Slam winner Garbiñe Muguruza, two-time Grand Slam winner Angelique Kerber, two-time Wimbledon champion Petra Kvitova, reigning French Open champion Simona Halep, 2018 Australian Open champion Caroline Wozniacki and 2017 French Open champion Jelena Ostapenko. The player field however is just part of the story. Tournament Owner IMG and Miami Dolphins Owner Stephen Ross partnered to keep the Miami Open in Miami and have worked together to build a permanent world-class tennis facility that will provide an elevated fan experience while incorporating a unique Miami look and feel. The improved amenities will allow the tournament to host a true lifestyle and entertainment event featuring the best in tennis, art, food and music. 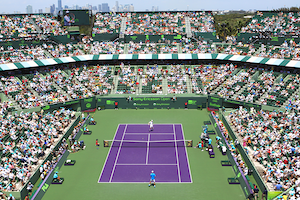 Tickets to the 2019 Miami Open are on sale now and available by phone at 305-943-6736 or online at www.miamiopen.com. Individual session tickets start at just $28 so get your tickets today. Ticket packages, group programs, and luxury hospitality offerings also are available. Qualifying rounds will be March 18-19 and will determine 12 additional slots in each singles draw. The Miami Open also will award wildcards to five men and eight women. The women’s main draw begins on Tuesday, March 19, followed by the first round of the men’s main draw on Wednesday, March 20. The 53rd career meeting between Novak Djokovic and Rafael Nadal, world number 1 and 2 respectively, took place in the final at the Australian Open. The Serb dominated the 17 time major champion 6-3, 6-2, 6-3 to hoist the trophy for an unprecedented seventh occasion and bank his 15th major title. Djokovic continued to display the form that garnered him the last 2 majors, Wimbledon and the U.S. Open, beginning the match with a love hold. Quickly, the world number one had double break point when Nadal buried a backhand crosscourt into the net. The Spaniard had not yielded a break since the opening round. With Nadal flubbing an easy forehand, Djokovic secured the game. He bolstered the break by capturing his 8th consecutive service point for 3-0. After saving break point, Nadal finally posted a game on the board. Still, Djokovic kept on rolling extending his lead to 5-2 after his fourth hold at love. The Serb surrendered only 1 point as he shut out the opening set 6-3. Few competitors have succeeded in frustrating Nadal or making him look ordinary, especially in a final at a major. That’s exactly what Djokovic accomplished up to this point. After Nadal pocketed a tough first game to start the second set, Djokovic breezed through to square the proceedings at 1 all. With another arduous game, Nadal had his first lead for 2-1. However, the satisfaction was short lived as Djokovic cruised again on his serve to level the score at 2-2. The next few minutes pressed into mistakes after mistakes, Nadal stared at double break point as he hit his racket in disgust. As the Spaniard’s lob landed long, Djokovic converted the break for 3-2. Nadal’s best chance came the following game at 15-30 and deuce. But, the Serb pushed harder on the accelerator to eventually consolidate for 4-2. With a forehand up the line winner, soon, Djokovic was in position to nab a double break lead. He did so when Nadal dumped another forehand stroke into the net. The Serb finished the second set by winning four successive games. Up to this juncture, Nadal had yet to manufacture a break point. His forecourt game which had worked beautifully this fortnight had deserted him, his first serve offered no solace. As Djokovic blanketed the baseline, Nadal was literally being pushed out of the stadium with each stroke. The Spaniard needed to rethink his tactics, minimize his errors and have his rival’s level of play dip. In the third game, misfiring on a forehand down the line, Nadal gave Djokovic double break point. With the Spaniard unable to handle a forehand volley, the Serb grabbed the break for 2-1. There had never been a straight sets victory in all of their previous 7 major finals. Winning 86% of his first serves, 89% of his second, with 28 winners and 4 unforced errors up to now, Djokovic was looking to make this one the first. Subsequent to his counterpart consolidating for 3-1, Nadal quickly held to keep the deficit at one game. In the sixth game, at last, Nadal had his maiden break point of the contest when Djokovic netted a makeable forehand. Anew, Nadal’s backhand failed to clear his side of the net, the score was at deuce. Djokovic simply would not be denied. With a couple of winners, the Serb was at 4-2. Down 3-4, Nadal again pushed his opponent to deuce, but to no avail. With a let court volley winner, Djokovic marched on for 5-3. Then, after 2 hours and 4 minutes, a forehand up the line winner gave the Serb double championship point. Djokovic cashed in on his second opportunity, when Nadal’s backhand went long. Never one to forget the spectators, the Spaniard recognized them by saying “all the people, all the fans have been fantastic. The connection with all of you is difficult to describe. When I am not playing what I miss the most is the support and the love of all of you, many thanks”. For Nadal, it’s always about perspective “I know tennis is not forever. We are not 20 anymore. My only goal is to keep going and fight for the thing that makes [me] wake up every morning. I want to do it as long as I can. You appreciate your rivals because you share a lot of important moments in your lives”. Collecting his seventh Norman Brooks Challenge Cup, Djokovic complemented Nadal “on a great couple of weeks. . . You were unfortunate throughout your career to go through some injuries. You are showing me, other colleagues and many young tennis players throughout the world what is the definition of the fighting spirit and resilience, thank you for that”. Djokovic went on to say “I had surgery exactly twelve months [ago]. To be standing now in front of you today, managing to win, this title, 3 out of 4 slams, this is truly amazing. I am speechless.” Moreover, he cited “I would like to thank my team. [Tennis] is an individual sport, but you guys are always behind me, tolerating me on my bad days. You are putting together a great successful formula that is working really well. Marian [Vajda], thank you for coming back to my team. . . [to my wife and kids], trophies are even more special when I have someone so dear, so special to me in my life to share it with. They are the dearest thing next to my parents and two brothers. I want to thank them for unconditional support. Through all these years, they’ve sacrificed a lot of their time and energy for me to live my dream, I always try to remind myself and not take that for granted”. For Djokovic, in addition to the physical, it also seemed a matter of motivation, the last couple of years. But, he certainly found it again “the very essence of why I play the sport, love and passion for the game. I had to dig deep. That kind of pure emotion got me going. Nadal historically throughout my life and career has been the greatest rival that I’ve played against. Those kind of encounters have made me the player I am today without a doubt. These are the kind of matches you live for, the finals of slams against the greatest rival, what else can you ask for”, indeed. If Djokovic maintains the kind of focus he’s demonstrated since June of 2018, he will be impossible to halt. Consequently, 2019 may be the year which marks finally a true grand slam, Djokovic holding all 4 majors in the same calendar year. The 2019 Australian Open championship was a contest between two endearing women. Naomi Osaka world number 4 and Petra Kvitová ranked 8th. The fact that these were not novices, the former the reigning U.S. Open champion and the latter 2 time Wimbledon titlist, foretold the potential for a thrilling final. It lived up to its billing. In the end, Osaka walked away with the Daphne Akhurst trophy by prevailing 7-6, 5-7, 6-4. Osaka displayed her anxiety by double faulting to begin the match. Yet, the Japanese star managed to hold serve. Her initial time, Kvitová sailed through with a love game which Osaka duplicated for 2-1. In the fifth game, Kvitová twice tattooed backhand crosscourt return winners to set up break points. Still, Osaka found the ripcord to stay on serve at 3-2. Then by forcing a forehand miscue from her rival, the Japanese player set up break point. However, the Czech star successfully extricated herself out of that situation. Swiftly, with a double fault and backhand mistake by Osaka, Kvitová had triple break point. Anew, the 2018 U.S. Open winner battled to level the score at deuce and pocketed the game for 4-3. Serving at 5-6, Kvitova netted a backhand to gift Osaka set point. With a winner, the Czech wrestled herself out of that jam. Osaka had a second chance to wrap up the set which she wasted. Thus, the tiebreaker was called upon. Osaka took control by striking backhand down the line return winner for a 2-0 mini break lead. Then, with a forehand up the line winner, she secured a 5-1 cushion. The Japanese competitor promptly closed out the set. Kvitová responded to the challenge by holding to start the second. Also, seventh time was the charm, as the Czech thumped a forehand return crosscourt for a winner to break for 2-0. Unable to consolidate on three game points, Kvitova double faulted to hand Osaka break point. Soon, Kvitova misfired on a backhand to donate the game. Later, Osaka converted on triple break point and bagged the next 4 games. Nevertheless, Kvitová didn’t relent. Down 3-5 and 0-40, one point from defeat, with stellar serving, the Czech won the next 5 points to hold. Incredulous, Osaka faltered attempting to finish things off. Visibly perturbed as a double fault handed Kvitová double break point. Osaka erred on a forehand to equalize the set at 5 all. After salvaging break point, Kvitová seized on a break point opportunity. She pocketed the 4 consecutive games to push the final to a deciding set. Towards the latter part of the second, Osaka’s emotions overwhelmed her. She berated herself for each error and concluded with a double fault on triple break point. Coming out to play the third, it’s as if she turned on the serenity switch. Kvitová continued the momentum with a love hold. However, the Japanese star halted the slide for 1-1. Then, she capitalized on a double fault which contributed break point by landing a backhand crosscourt winner. Subsequently, Osaka extended her lead to 3-1. Still, the Czech preserved. Serving at 2-4 and down 0-40, once again, Kvitová escaped by connecting choice serves and winners. Surely, Osaka had to do her utmost to block out the sensation of deja vu. Unlike the second set, Osaka shrugged away the evaporated chances with a love game. Regardless, Kvitová was going to make the 21 year old earn the victory after holding for 4-5. Demonstrating nerves of steel, Osaka stepped up with an ace, forehand up the line winner and provoked a backhand wide from Kvitová to arrive at triple championship point. Finally as on Osaka’s 5th try, as Kvitová backhand travelled wide, she secured the trophy. Above all, Kvitová realized that without the support from family, friends and her team, she would never reach this stage “thank you for sticking with me even though we didn’t know if I’d be able to hold the racket again. Every single day supporting me, staying positive for me when I really needed it. It probably wasn’t easy. Thank you so much”. Osaka is the first back to back winner at the majors since Serena Williams in 2015 and the first since Jennifer Capriati in 2001 to triumph at their initial first two tries at the majors. In disbelief of her accomplishments, Osaka began by apologizing “sorry, public speaking is really not my strong side. Huge congrats to you Petra. I’ve always wanted to play you, you’ve been through so much. Honestly, I would not have wanted this to be our first match. Huge congrats to you and your team. You are really amazing and I’m really honored to have played you in the final of a grand slam”. The Japanese player went on to say to the crowd “I want to thank you guys for coming and watching. It’s really hot at times, [nevertheless], you come out and show support. I really want to show my gratitude to you”. She also acknowledged her box “I don’t think I would have made it through this week without you guys. Behind a tennis player there is always a team, so I’m really grateful. So thank you everyone. I’m really honored to have played in this final”. Osaka’s rise appears meteoric to those on the sidelines, finishing at 144 in 2015, floundering in the top 70’s in 2017 to this stage. Yet, she iterated “to me it doesn’t. For me, every practice, every match that I’ve played, the year feels short and long at the same time. But I’m aware of all the work that I’ve put in; I’m aware of all the sacrifices that every player does to stay at this level. In my opinion, it didn’t feel fast. It feels kind of long”. Prior to the match, Osaka reflected “everyone has dreams that they want to win. I’ve had dreams that I’ve won this tournament and I don’t want to jinx it. Now that I’ve won a grand slam, the biggest thing for me is the belief. I think I believe in myself more this year. I want to win another one. I feel lucky that I’m kind of unknown. I’m a ghost, you don’t see me”. Even if she or others may have thought the U.S. Open was a fluke, with her second major, Osaka is no longer invisible any longer. Moreover, by ascending to world number one, she has beenforced out the shadow into the light. The Australian Open is her coming out party. Agnieszka Radwanska, the 2012 Miami Open champion, announced her retirement from the WTA professional tennis tour. The former world number 2 from Poland made history when she became the first Polish player, man or woman, to reach a Major singles final at the 2012 Wimbledon Championships. Known for her crafty all court game, Radwanska will be missed on the WTA tour. Poland’s Agnieszka Radwanska announced today her retirement from professional tennis. She leaves the game following 20 career WTA singles titles, highlighted by the 2015 BNP Paribas WTA Finals Singapore presented by SC Global trophy. Radwanska became the first player from Poland – man or woman – to reach a Grand Slam singles final at 2012 Wimbledon, which helped her reach a career high ranking of WTA World No.2. She earned over $27.6 million in prize money over her career, which currently ranks seventh on the all-time career prize money earnings list. In addition to her on court accomplishments, Radwanska, also known as “the Magician” by fans and media due to her crafty style of play, was voted the WTA Fan Favorite for six consecutive years. Radwanska played her last professional match in September at the KEB Hana Bank Incheon Airport Korea Open in Seoul. Click here to read more on Radwanska’s remarkable career. Both U.S. Open finalists were on the precipice of history. For Serena Williams an eighth title at Flushing Meadows would have been another accolade by equalizing Margaret Court with a record 24th major. While for Naomi Osaka lifting the trophy would brand her as the first individual from Japan to ever capture one of the sports’ highest honors. Ultimately, it was the 20 year old who realized her dream. Osaka surprised Serena 6-2, 6-4 to capture the championship. For Osaka, who as a youngster watched from the top bleacher as her idol held court at this same venue, to be in the final felt “a little bit, surreal. Even when I was a little kid, I always dreamed that I would play Serena in a final of a Grand Slam. Just the fact that it’s happening, I’m very happy about it. At the same time I feel like even though I should enjoy this moment, I should still think of it as another match. Yeah, I shouldn’t really think of her as, like, my idol. I should just try to play her as an opponent.” That approach to the biggest encounter of her budding career served her well. Perhaps it was a display of nerves at the start, but each player overcame a 0-30 deficit in her opening game. However, with Serena’s forehand flying long, Osaka had a break point. With the American miscuing with a double fault, Osaka went up 2-1. Soon, with an ace at 40-15, the Japanese protégé confirmed the break. In the next game, applying pressure with her groundstrokes, Osaka had Serena facing break point. When the American’s backhand found the net, Osaka secured a 4-1 cushion. With a forehand volley winner, Williams secured her initial break point. Coolly with an ace, Osaka was at deuce. With Serena failing to capitalize on another break point, Osaka built a 5-1 lead. Visibly flummoxed, Serena with the support of a boisterous crowd climbed out of 0-30 hole to hold. Yet, Osaka would not be denied. Up 40-15, she saw Serena dump a forehand return into the net to cap the opening set. Osaka’s best previous showing at a major was the fourth round at this year’s Australian Open where she succumbed to world number one, Simona Halep. Thus far, her first and only career title came this year at Indian Wells. Her next tournament at the Miami Open, she stunned Serena in the early rounds who had been back from maternity leave. But, since March, Osaka’s results had been subpar. Although Osaka had a record 31-0 after winning the first set, this was the big league. The experience chasm which divided these two in terms of experience couldn’t be starker. However, the combination of Serena’s dire 38% first serve stat, her 2-7 mark in major finals after surrendering the first set, the last comeback being 13 years ago at the Australian Open, underlined that Osaka had history on her side. In the second game with Osaka serving, Serena got saddled with a coaching violation by chair umpire Carlos Ramos. Coach Patrick Mouratoglou’s hand gesture, signaling for her to move forward caught the umpire’s eye but was not seen by Williams. Perhaps this infraction was the fuel Serena needed. Up to now, Osaka was a wizard at making break points disappear, 16 in her previous two matches, 13 alone in the semifinals against Madison Keyes and two already today. With a backhand return winner, Serena had her fourth break point of the fourth game. As Osaka’s backhand landed long, Serena finally had chiseled a 3-1 edge. But an ace for 30-15, followed by successive double faults and a backhand error was how Serena’s service game unfolded. She responded by smashing a racket. Tagged with a second code violation, Serena did not realize that it meant an automatic loss of point. With an ace at 40-0, Osaka comfortably held for 3-3. Next, with a backhand up the line return winner, the Japanese hopeful was at 30-40, she connected with a forehand up the line pass winner to seal the break for 4-3. Incensed, Serena could not let go of what she viewed as an injustice. During the changeover, she labeled Ramos a “thief”. He retaliated by giving her a third code violation for verbal abuse. This time, the consequence was a loss of a game, “I called you a thief because you stole a point from me”. In shock and disbelief, Williams resorted to the referee. But, what was done, could not be undone, Osaka was awarded a game for 5-3 without striking a ball. After Serena’s love hold, it was Osaka’s turn to be under pressure. With an ace, the youngster arrived at 40-15. On her second try, with an unreturnable serve, Osaka closed out the match. There was no outward excessive celebration by Osaka who had defeated her idol on the largest stage in tennis. Her reaction is reflective of her personality according to her coach Sascha Bajin, Serena’s former hitting partner, who began working with her last November “I think everybody. . .on this planet can learn a lot from that girl in order to maintain that innocence. I believe the more open we are and the more honest we are and show vulnerability sometimes and who we truly are, the better this world is going to be. And all the fake emotions, I’m not a fan of it. I believe that, yeah, she’s a star for that.” Serena hugged her at net and told Ramos “you owe me an apology”. Certainly, an awkward time for this 20 year old who with serenity and poise had a fairy tale outcome, but not quite the finish she dreamt of “I know everyone was cheering for her. I’m sorry it had to end like this, [with tears streaming down], I just want to say thank you for watching the match. It was always my dream to play Serena in the U.S. Open final. I am glad I was able to do that. I’m grateful I was able to play with you, [turns to Serena and bows], thank you” Osaka displayed mixed emotions “I know she really wanted to have the 24th grand slam. Everyone knows, it’s on the commercials everywhere. When I step on the court, I feel like a different person. I’m not a Serena fan. I’m just a tennis player playing another tennis player. But when we hugged at net, I felt like a kid again. . .When I was growing up, I did a whole report on her in the third grade. [I said] I want to be like her”. Serena is no stranger to controversy at the U.S. Open. In 2004 in the quarterfinals against Jennifer Capriati, at least three blatant ruling errors, including an overrule by the chair umpire on a clear out ball, likely cost her the match. Those flubs ushered in the era of electronic review. In the 2009 semifinals down 4-6, 5-6, a second serve foot fault at 15-30 brought on a harangue which resulted in a second code violation and point penalty to hand Kim Clijsters the match. Serena viewed the coaching violation as unfair “one thing I love about tennis is being out there and it’s the one time I don’t want to hear anyone tell me anything. It’s my moment of peace. You have to figure it out and you have to problem solve.” For Williams, the game penalty was a gender issue “I’ve seen other men call other umpires several things. For me to say thief and for him to take a game, it made me feel like it was sexist remark. He’s never taken a game from a man because they said thief. It blows my mind. But, I’m going to continue to fight for women. . .[Alize] Cornet should be able to take off her shirt without getting a fine, it’s outrageous”. The tennis world is warming up to this newly minted champion, the youngest U.S. Open titlist since Maria Sharapova at age 19 in 2006. Osaka contributes her success to Bajin in turning her from a top 60 player to a top 10 competitor, her ranking will shoot up from 19 to 7. “Sascha is a really nice person, he’s really positive and upbeat. I think for me that’s really important because I tend to be down on myself a lot”. Has Serena’s behavior soiled her image in her eyes in any way? Osaka cited “I don’t know what happened on the court. For me, I will always remember the Serena that I love, It doesn’t change anything. . .She was really nice at net and on the podium. So I don’t really see what would change”. Although born in Japan, Osaka represents the quintessential American story. Born to immigrant parents, father is Haitian, mother from Japan. She grew up in Brooklyn and trains in South Florida. If she continues to emulate her idol’s play on court, with her humble demeanor, the U.S. will want to adopt her as their own considering she holds dual citizenpship. Novak Djokovic dispatched Kevin Anderson 6-2, 6-2, 7-6 in the Wimbledon finals in order to acquire his 4th major at that the All England Club. At the beginning of this fortnight, it’s unlikely that the odds maker had the South African on their radar. Anderson, the 2017 U.S. Open runner up, shocked Roger Federer in the quarterfinals. Never previously winning a set in their four prior meetings, he overcame a 0-2 set deficit, match point, to prevail 13-11 in the fifth, in a match lasting 4 hour and 14 minute. Two days later, clashing with John Isner, a player no stranger to marathon matches, Anderson outlasted the American 26-24 in the decisive set, he was on court for 6 hour and 36 minute. Djokovic for his part endured a 5 hour 15 minute tussle with Rafael Nadal in the semifinals over two days edging the Spaniard 10-8 in the fifth. Would fatigue be a factor as Anderson attempted to elevate his status not only to the first South African to get to the last dance, but to that of victor at this venue? The two competitors had met 6 times before. The South African’s sole win was at the Miami Open in 2008. Anderson’s inability to connect on his most valuable asset the serve, gave Djokovic the initial game as the South African double faulted. Swiftly with another errant forehand by Anderson, Djokovic consolidated for 2-0. Later, with Anderson dumping a backhand volley into the net, Djokovic capitalized on another break point and with a love game padded his lead to 5-1. With this insurmountable advantage, Djokovic eventually captured the set. Concern over his right elbow prompted Anderson to call the trainer for treatment, however, this was not sufficient to slow down Djokovic. A backhand miscue handed Djokovic breakpoint in the opening game. In a carbon copy of the first set, the Serb cashed in and after a hold jumped in front 2-0. Down the road, a double fault by Anderson gifted Djokovic 15-40. With the South African’s forehand up the line landing wide, Djokovic moved ahead 4-1. Serving for the set at 5-2, Djokovic’s stroke misfired off a tremendous return by his opponent. Yet, Anderson failed to convert on his first break opportunity. Djokovic went on to pocket the second set. In the third set, with time his adversary, Anderson changed tactics slightly by coming to the net more frequently. In the eight game, a let court allowed the South African to control the point and get a break chance. However, with his backhand traveling long, Djokovic arrived at deuce and ultimately leveled the score at 4-4. The Serbian stared down two set points in his next service game. After a love hold by Anderson for 6-5, his best window to take the set came with Djokovic’s forehand down the line flub giving him 15-40. Still it was a no go. A third break point was swiftly dismissed by Djokovic. Soon with an ace, the score was 6-6. In the tiebreaker, Djokovic curled a forehand up the line pass for a winner for 3-1. Then, with Anderson’s backhand volley missing it’s target, the Serb sprinted to a 5-1 edge. With Anderson’s return finding the net, Djokovic sealed the deal at 7-3. When the new rankings are revealed, Djokovic will rejoin the top 10 from his current position at 21. While Anderson crack the top 5 for the first time from his spot at 8. Angelique Kerber was at this stage twice before in 2016, meeting Serena Williams in finals. At the Australian Open, she surprised the American to obtain her first major. But Williams turned the tables on the grass to acquire her 7th Venus Rosewater dish. Today, Kerber’s steely defense once again proved impenetrable as she bested Serena 6-3, 6-3 to finally earn the coveted silverware. This was their 9th meeting with Williams holding a 6-2 winning record. Subsequent to starting the match with 30-0, Serena committed a string of unforced errors to gift Kerber the opening game. The German backed up the break by claiming the second game. After seven unforced errors, the total of what she tallied the entire match in the semifinals facing Kerber’s compatriot, Julia Goerges, Williams settled down. With a break at love, she levelled the score at 2 all. But with consecutive double faults in the seventh game, the American found herself under the gun at 0-40. With Williams’ forehand landing long, Kerber secured a crucial break and by pocketing the next game led 5-3. With Serena’s backhand finding the net at 30-40, Kerber pocketed her third break and the first set. Coming into the finals, the American had the fewest unforced errors compared to the rest of the field with Kerber second in that category. By the way she littered the lawn today, no one would have deduced that. Moreover, in the opening set, Williams won one point off her second serve. As the match progressed, Kerber continued to sure up her defensive play. What would have been uncontested winners against any other opponent, resulted in errors, whether forced or unforced, on Williams’ stat sheet. A prime example was with Serena serving at 2-3, Kerber sprinted to a casual volley on her part to blast a winner for 15-40. Soon with a running forehand winner up the line, Kerber sealed the next game for 5-2, four points from her maiden Wimbledon title. By securing the next game at love, Serena kept her hopes for an 8th Wimbledon title alive momentarily. Promptly, with a sensational forehand up the line winner, the German arrived at championship point. Serena’s return miscue ultimately cemented the victory for Kerber. In defeating Williams, Kerber becomes the first German since Steffi Graff, her idol, in 1996 to triumph on the All England Club. Also, She stopped the American, at least for now, who remains knotted with Graff, 23 majors and 7 Wimbledon trophies. After a brilliant 2016 including reaching number 1, Kerber’s stock declined finishing 2017 ranked 21. A new coach, a title in Sydney this year, her first since the U.S. Open in 2016, the German is once again on the rise at age 30. On Monday, her ranking will improve from 10 to 4. For her part, Serena Williams gained a lot of ground with her showing, her ranking will catapult to number 28.